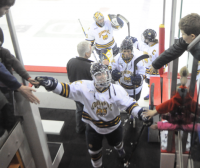 Quinnipiac’s Nicole Connery skates along the boards in Sunday’s game vs. Colgate. Quinnipiac’s Reagan Boulton takes a shot in Sunday’s game vs. Colgate. Quinnipiac’s Kelly Babstock falls to the ice in Sunday’s game vs. Colgate. Quinnipiac’s Nicole Kosta takes a shot in Sunday’s game vs. Colgate. Quinnipiac’s Nicole Kosta vies for the puck in Sunday’s game vs. Colgate. Quinnipiac’s Brittany Lyons skates along the boards in Sunday’s game vs. Colgate. Quinnipiac’s Kelly Babstock vies for the puck in Sunday’s game vs. Colgate. 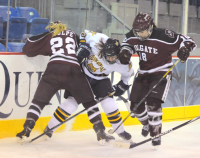 Quinnipiac’s Nicole Brown vies for the puck in Sunday’s game vs. Colgate. Quinnipiac’s Brittany Lyons vies for the puck in Sunday’s game vs. Colgate. Quinnipiac’s Shelby Wignall celebrates after a goal in Sunday’s game vs. Colgate. 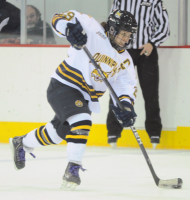 Quinnipiac’s Breann Frykas skates in Sunday’s game vs. Colgate. Quinnipiac’s Nicole Brown takes a shot in Sunday’s game vs. Colgate. Quinnipiac’s Nicole Kosta scores a goal in Sunday’s game vs. Colgate. 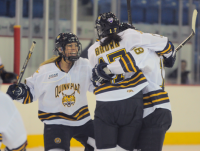 Quinnipiac’s Nicole Kosta celebrates after a goal in Sunday’s game vs. Colgate. 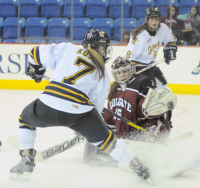 Quinnipiac’s Victoria Vigilanti makes a save in Sunday’s game vs. Colgate. Quinnipiac’s Amanda Colin vies for the puck in Sunday’s game vs. Colgate. The Quinnipiac seniors celebrate after Sunday’s win vs. Colgate.